Many home sellers want to get into the real estate market on their own without consulting the counsel of an experienced real estate agent. Why? We are in a seller’s market and sellers assume that it will be more beneficial to them if they sell it themselves…mostly because they want to save $$$ on the commission. BUT what sellers don’t realize is the value that an agent can provide. Just because it’s a seller’s market doesn’t mean that there isn’t a market to master. Marketing, negotiations, maximizing profit…if you’re currently considering going agentless, here are some reasons you may want to get an expert involved. Let’s get right to it. The process isn’t just about selling your home, it’s about maximizing what you are able to make off it. Put it this way, with a good marketing strategy you can actually end up getting up to 18% more money from your home than if you went FSBO…I’m not over exaggerating here. You want to drum up as much competition as possible, rather than just taking the first offer that comes your way. 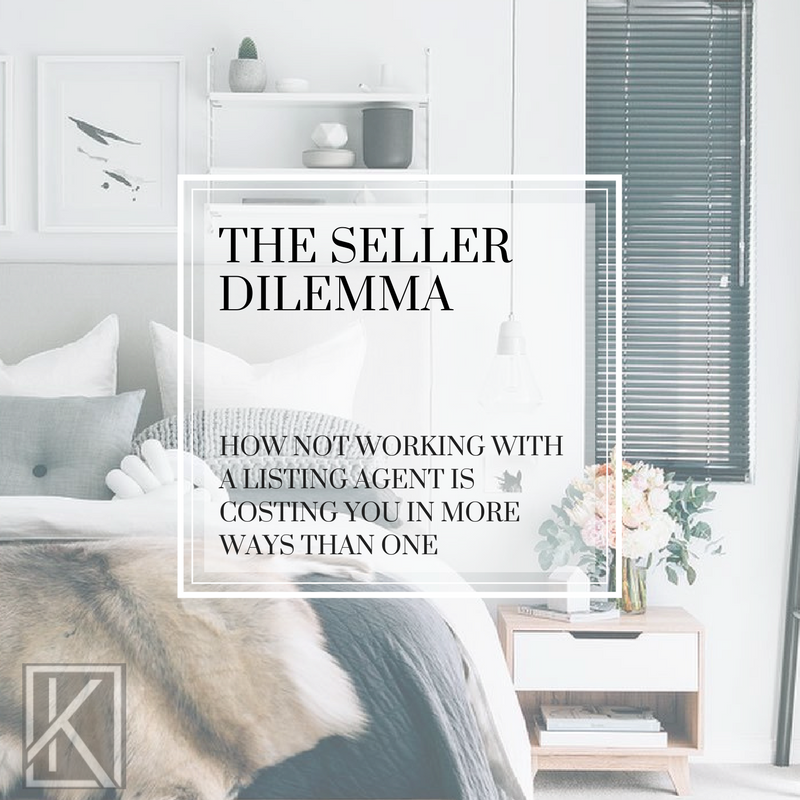 So believe me what I say that the dollar amount you spend working with an agent can be minuscule compared to the check you are missing out on because you chose not to invest in a real estate agent and marketing strategy. With social media sites like Facebook and Twitter, an assumption can be made that ‘it’s never been easier to sell your home online’. But, do you know who you are marketing to on those sites? Do you know how to run Facebook ads to connect with online buyers that are already active? Do you understand which of the dozens of sites are the most effective when maximizing your reach? A real estate agent will be able to determine the best social media strategy for you and decide how best to invest their energy (and $$$) in order to reach the kind of homebuyers you’re looking for. Beyond making a website, having professional pictures taken and a home video, they’ll also be able to leverage their presence online to attract other interested parties who likely won’t have found your home otherwise. The benefit of this is that you are more likely to receive multiple offers. It’s easy enough to look through the MLS listings and get and good sense of what a home in your neighborhood is worth, but a good real estate agent will already know your area and be able to make a better assessment. What are your goals? Do you need a quick sale? Do you want to wait it out until you get a super competitive offer? Do you know how to navigate the market enough to make sure you get the activity you’re looking for? Not only will real estate agents be able to determine what you can sell your home for in the real estate market you’re heading into, they’ll be able to provide the appropriate price with strategy aimed at driving the right type of activity to meet your goals. One of the toughest parts of any real estate transaction is the negotiating, and it goes without saying that having an experienced agent along to seal the deal can be more than a little comforting. While it’s all well and good if the home inspection was positive and you got your asking price, the right agent can be instrumental in providing the right advice and price in case there are counter-offers. It’s just important to do the research so you can find the right agent for you. Not to mention, you are going to be working with legal documents. The last thing you want is to get in a legal battle because you made a mistake or be out thousands of dollars out of pocket because you didn’t check the correct box on the form. Many homeowners like the idea of navigating the real estate market on their own, but an experienced agent can make the process of selling your home a lot easier and more profitable at the end of the day. If you’re currently getting prepared to put your home on the market, contact us at homes@keelinghomes.com or 608.616.0115 for more information.